There was a lot of frustration with Outlook 200x. If an Access MDB file is received, Outlook expects the worst and blocks the attachment. The trick has been to ZIP the file or change the extension to something like .DAT. Here's a registry trick that restores Outlook to the good old days. Under that key, add a new string value named Level1Remove. would unblock Microsoft Access files and Internet shortcuts. Note that the use of a leading dot was not previously required, however, new security patches may require it. If you are using "mdb;url" format and extensions are blocked, add a dot to each extension. Note also that there is not a space between extensions. If you are using this registry entry, a glance at Help>About Microsoft Outlook will show Security Mode: User Controlled above the license information. After applying this registry fix or using one of the above tools, the user still has to save the attached file to a system drive before opening it. 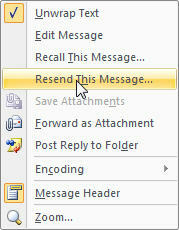 In effect, the fix rolls the attachment behavior back to Outlook 2000 SR-1, with its included Attachment Security Fix. An end-user cannot bypass this "save to disk" behavior and open the file directly from the mail message, though an Exchange administrator can. Let's say you get a message that you would like to forward, but you don't necessarily want to take "ownership." The message will be from you, "on behalf of" the original sender. IMPORTANT: If the recipient clicks the Reply button, his message will go to the original sender, not to you. If you want to send an email to a list, but omit a few of its members, Click on the plus sign next to the distribution name. Click OK to expand the list and remove members who you do not want to receive the email. Rather than creating and updating a distribution list as a list of names, you could use Categories. To add or remove names from a mailing list, just add the category or remove it from the contacts form. If an email address changes, only the contact form, not the distribution lists needs to be updated. Send a message or meeting request to the group or create appointments or tasks, by opening the Contacts folder and use the Group By Category view and select the desired group. Choose the desired action from the Actions menu. The drawback here is that all of the names will be displayed on the To: line. They can, of course be cut and pasted to the BBC: line. In Calendar, select a calendar to make it the active calendar in the view. 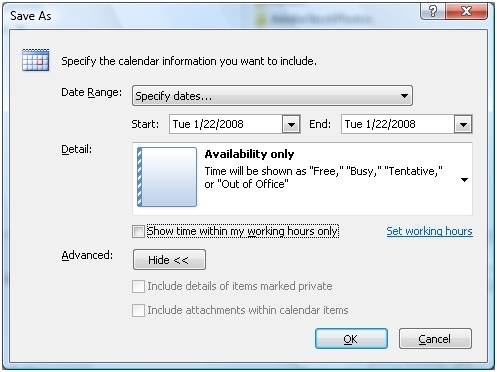 Type a name for the iCalendar file in the File name text box. A summary of the calendar name, date range, and detail level appears next to More Options. From the Date Range list, choose the amount of calendar data to include in the iCalendar file, or click Specify dates to enter a custom date range. From the Detail list, choose the amount of detail to show the recipients. Here's how to resend a message. The intended recipient might have accidently deleted it or would just like to see it again. 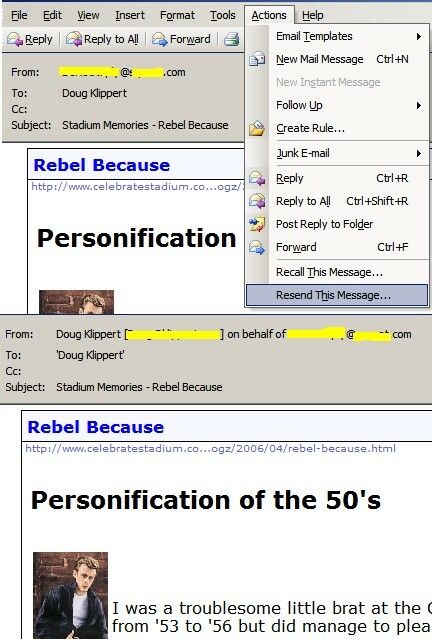 In Outlook 2003 â€“ look on the Actions menu.